« Show Your Support With a License Plate! 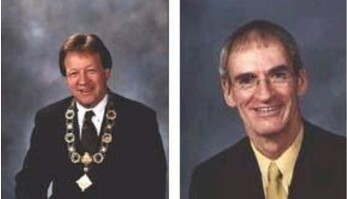 During the April 10th council meeting, on a motion brought forward by Councillor Cecil Villard (right), Charlottetown City Council voted unanimously to ask Canada Lands Company to withdraw its application for the development of the Upton Farmlands. Mayor Clifford Lee (left) said this action will be followed up by a letter to CLC, Prime Minister Stephen Harper and Transportation & Infrastructure Minister Lawrence Cannon, who represents the Department responsible for CLC. Councillor Villard said the “best possible outcome” would be for CLC to deed the Upton Farmlands over to the City. This, folks, is a significant step forward in our journey to save this land for greenspace. It is a time to take pride in all the hard work we have done to raise awareness and share the vision of a gateway to Charlottetown, a Victoria Park for the future, instead of just another housing development. It is a time to appreciate, again, all those who have signed the petition and written to their political representatives, for without the involvement of those many, many citizens this initiative would surely be dead in the water. We have several more stairs to climb before this land is truly protected for future generations of Islanders. Please continue to give your support by writing letters to the newspaper, buying a license plate and talking to your friends and neighbours. As well, please take a minute to e-mail every member of City Council and thank them for taking this step. This entry was posted on April 10, 2007 at 11:40 pm and is filed under Letters of Support, Raising Awareness. You can follow any responses to this entry through the RSS 2.0 feed. You can leave a response, or trackback from your own site. Great News! First Wes & Wayne, now Cecil & Clifford et al. The powers that be are starting to see the light! With the City and the Province standing together with you, there is real hope that the land can be preserved. Let’s hope they can translate these words into action! Thank you City Council. It is wonderful to know we are represented with such responsible people. Thank you to all of you who have worked so hard to save Upton Farm for the enjoyment of all of us now and in the future. You have worked effectively together, and you have offered PEI politicians the opportunity to show leadership to preserve this unique piece of green space in Charlottetown. And politicians have responded. As you say, there is much more work to be done, but this is an excellent beginning. Well done, and keep up the good fight.